Cadillac's an old man's brand full of floaty, slow, soft luxury cars. Screw that. This is the Cadillac CTS-V Coupe — packing a supercharged 6.2-liter V8 with 556 HP, a six-speed manual, and not-enough-room for full-sized rear-seat passengers. Screw 'em. Perhaps you're of the opinion passengers are a burden more than a benefit, offering only trite small talk and body odor. In your worldview, a coupe is a far superior conveyance to a sedan and thus the the Cadillac CTS-V Coupe is now the greatest single thing ever to wear a wreath and crest. It has the same 6.2-liter LSA V8 as the sedan packing 556 HP and 551 lb-ft of torque, the same 3.9 second 0-60 MPH time, the same magnetic ride system, the same manual transmission and paddle shifted auto, the same wheelbase and it only weighs about 18 lbs less. 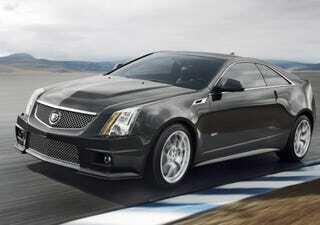 In short, it's everything the CTS-V is with an aversion to passengers. The point here is conspicuous consumption. It's a Cadillac, and screw reason. It's unreasonably fast, it's badass, and the proles can go to hell. from the CTS-V sedan. The result is a luxury sports coupe aimed at driving enthusiasts. choice for luxury sports car consumers." an available automatic transmission with paddle-shift control. street tires to break the legendary 8-minute barrier at Germany's famed Nürburgring. is offered, with contrasting microfiber seat inserts and stitching on the upper trim areas. performance intent of the car. about two inches (51 mm) lower and its overall length is two inches (51 mm) shorter. Coupe from 0-60 mph in 3.9 seconds. performance parameters of the engine. manual "gate" to put the transmission into that more aggressive mode. allow immediate and quick tap up/tap down gear selection. valves, to greatly accelerate response time and precision. tailor the suspension for grand touring or more spirited performance driving. four-piston calipers in the rear. resistance and eliminating fade. The brake rotors from Brembo employ a "dual-cast"
levels of grip in track conditions, while also affording good performance on the road. include pneumatic bolster controls in the seat cushions and backrests. information on Cadillac can be found at media.cadillac.com.